Every year during NaNoWriMo I inevitably hit the week two speed bump. The novelty is beginning to wear off, I still have no plot, and contrary to what Chris Baty assured me of when we started this crazy adventure, it’s beginning to become a problem: my main characters are flat and uninteresting, and most of all I am starting to miss things like seeing my friends and family, having leisure time, and cooking an actual meal. If you haven’t entered into week two purgatory and are still flying along excited and inspired, you are truly walking in the sun this November: keep going! If, like most of us, you are wondering what temporary flash of insanity led you to make this commitment, read on. It’s been my experience that if I am going to quit, I always quit in week two. But this post is not about quitting, it’s about dredging onwards and upwards because if you can survive the pain of week two you can survive the whole month. Things start getting magical in week three! To re-motivate myself when week two starts feeling more like a chore than an adventure, I round up my fellow WriMos and host a write-in. A write-in is like a party; there’s music, and snacks, and usually alcohol, but there are also laptops, and writing prompts, and timed challenges. The benefits are that you and your friends challenge each other and push each other to write, which means you actually produce words in the spirit of competition. It’s more fun because you have left NaNo isolation and are actually interacting with people, and when you get stuck you have a sounding board to bounce ideas off of. You also have other brilliant writerly minds to help you fill in your plot holes. Did I mention snacks? Likely everyone else participating in NaNoWriMo with you has also hit the week two slump and are dying to participate in a write-in. If you are a lone wolf, rope in your friends and family anyway, convince them it will be like board game night, only they will be doing short writing exercises that could potentially make their way into your novel. You’d be surprised how fun that sounds to people if it’s just for one night, especially when you give your best friend license to inexplicably insert a 400lb inflatable rubber chicken into your manuscript. Queue up your writing playlist, and encourage your friends to bring theirs along as well. Arrange your furniture in a comfortable, loose circle so you are all have a place you can sit comfortably with your writing instruments of choice. I like to arrange cushions and chairs around a low table so we can all rest our laptops on it and reach the food at the same time. The key to a good write-in is good snacks and lots of caffeine. Stick to finger foods that can be easily grabbed mid-writing and brew a fresh pot of tea or even break out the wine. 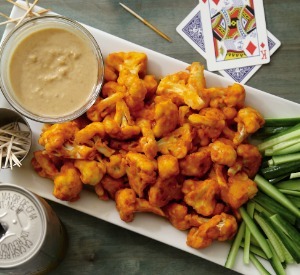 We recommend the Roasted Sriracha Cauliflower Bites from Thug Kitchen because they are like little healthy chicken wings and have a great kick to them, not to mention they take 20 minutes max to throw together. If you are after something sweet instead maybe try the Thug’s Peanut Butter Buckeyes. Write-ins are most productive when you have planned activities. Ask everyone to bring a list of five prompts, or adopt some from the thread on the NaNo Forums, and use them to challenge each other to word wars (set an amount of time and see who can write the most for that specific prompt. We recommend 10 minute bouts). See what other fun games you can come up with; there are many recommendations in the forums. 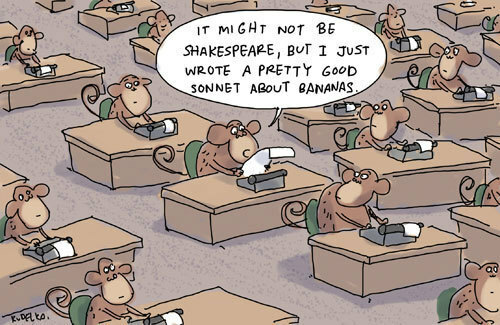 Most importantly, take a picture of all the fun you are having and tweet it @HouseofAnansi!